Up until recently, I didn’t believe in magic bullets and shortcuts for Kickstarter success. The vast majority of successful projects are successful because the creator put in a lot of hard work and made a lot of smart decisions. A tastemaker is a person, organization, or platform that reaches and influences millions of people, usually on a daily basis. These are the Pewdiepies, the Patrick Rothfusses, the Lady Ga Gas of the world. A single mention of your project by a tastemaker can have a huge impact on its success. I went back and looked at the stats from my Kickstarter campaigns to jog my memory, and it appears that Stonemaier has never had a tastemaker impact one of our projects in a significant way. 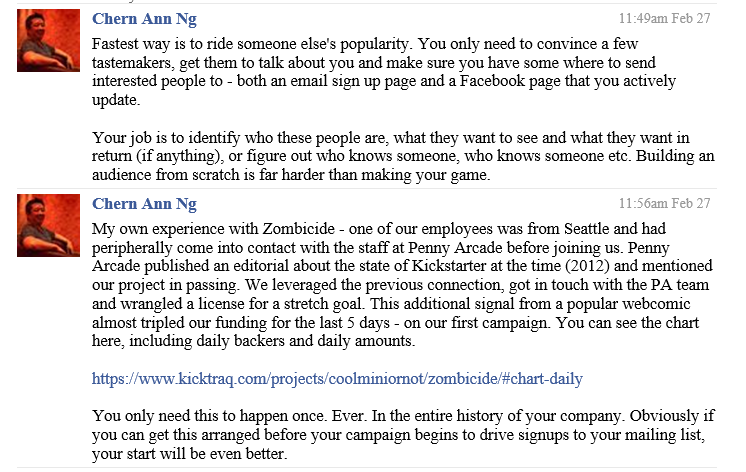 The closest examples were Shut Up & Sit Down ($12,013 in pledges) and Kotaku ($6,623) for the Scythe campaign. I mention that because identifying and leveraging a tastemaker (or just getting lucky) isn’t necessarily a magic bullet, nor does your campaign need one to be successful. But it doesn’t hurt to spend a small percentage of your time nurturing relationships with a few tastemakers. Worst-case scenario, you get to interact with some interesting people. I think this is 100% correct. If just once a true tastemaker mentions your project, whether it’s before, during, or even after your campaign (if you’re still accepting pre-orders), the backers it provides for you can become a strong foundation of a permanent fanbase. You might have gotten there eventually anyway, but a tastemaker can significantly accelerate the process. In other words, months before you launch your project, target a few tastemakers who you admire/follow or who are a good fit for your project. Learn about what they like and dislike. Interact with them in public (and, when appropriate, in private, but keep in mind that tastemakers get a lot of messages). Then, at the right moment, mention your project in a clear but non-aggressive way to see if there’s a way they might be compelled to talk about it on their platform. This is why it’s so important to have a home base where people can discover you and stay in touch. I recommend an e-newsletter, a Facebook page, and some sort of ongoing content (podcast, blog, etc). Again, finding a tastemaker is far from the only path to Kickstarter success. There are many more reliable ways to build a crowd and attract interest in your project. But there’s no doubt in my mind that a tastemaker can have a significant impact on your project and your company. Have you ever been influenced by a tastemaker? Or maybe you’ve seen a crowdfunding project’s funding goal skyrocket after a tastemaker mentioned it on their platform? I’d love to hear your story in the comments. Thanks Adrian. :) That’s nice to hear. I think we can be influenced by all types of content creators, even small ones like me. There are certain blogs and podcasts I follow that have relatively small audiences, but I still really trust their opinions. Funny, I was thinking the same thing. There are multiple Kickstarters I’ve backed after seeing Jamey back it. The “Follow” feature on KS is a terrific service to creators! I must admit that I feel a little extra pressure when backing projects now due to the people who follow me. It’s not always an endorsement of the project when I back something–sometimes I just want something or I’m curious about it or I think the creator is great. Even if it is not entirely ethical, you may use a second KS account to back those projects, but I would advise against it. Transparency is what Jamey taught till now. It doesn’t need to be an endorsement though – that’s sort of what’s missing here, you need to capture the interest of the tastemaker to post it, but then it also needs to align with the audience of that person. If Pewdiepie mentioned he enjoyed playing Scythe, I’m sure there would be some impact on sales but nothing like when he talks up a videogame. Indeed, I’d imagine Scythe being on Tabletop would actually convert to far more sales, despite having an audience smaller by an order of magnitude. Equally with SUSD, when the finally played Scythe they weren’t that into it, but their audience was and it didn’t actually matter. The endorsement mattered far less than putting the images in front of their userbase. This is actually one of my favorite subjects (and the basis of my current game project actually)! Network economics, in theory, are pretty much the basis for sales and marketing for any business these days, and pretty much all networks follow an exaggerated version of the Pareto Principle – more than 80% of all connections in a given network are through fewer than 20% of all members. So, if for some reason some small portion of that 20% pick up your product, you should see the greatest return on marketing possible. The helpful bit with something like gaming is that those well-connected individuals have big flags on them making them easy to identify: they host blogs, youtube channels, etc. and the subscriber counts are publicly posted. There’s a good Malcolm Gladwell book on the subject if you’re interested in some more eloquently worded anecdotes: “The Tipping Point”. Jamey would definitely qualify as one of the two biggest network hubs for Kickstarter Game Creators (Other being James Mathes) network, and a not insignificant hub in the overall tabletop game network. As always thanks for posting great advice for free! Love your blog, hopefully it’ll be one of the key reasons my first game eventually succeeds! “Network economics”–I didn’t know there was a term for this! Thanks for sharing. I love the Tipping Point. :) I look forward to seeing how you use network economics for your project. I participated in the C’mon project in the example. (I did so because of a local “mini-tastemaker.”) The project was bubbling along until one of the stretch goals was the character from Penny Arcade comic strip. The project went from 30 to 90 overnight. It was my first time participating in a Kickstarter project, so I stayed glued to my computer for the last week. Reaper Miniatures also had a Tastemaker npost in an email to everyone that interacted with Paiso. That email blast was much more effective than Penny Arcade was for CMoN. Reaper even made art available of their succubus mascot hammering on the F5 key to reload the web pages faster. I’ve heard “tastemakers” called “influencers” in other circles, and it’s definitely a tried-and-tested way of marketing. My takeaway is that it only has to happen once. It also depends on the tastemaker, in Lesson #27 you refer to using Bloggers, Podcasters, and Reviewers and reaching out to them. Many of these people are the tastemakers/influencers Depending on how big of a following you can get, it will lend something to your campaign. Take the Recent Giant Killer Robots. You have Cryptozoic and Weta Workshop working together to do this campaign, both big name companies, add to that the Tested channel doing various videos touring Weta Workshop, including one of them featuring GIANT sized GKR. It draws attention from many different fronts, how much of that influences the campaign I can’t say. Where did Chern An make these comments? Would love to see the context and can’t find the link in the post. Great blog—always a must read. An easy way is to search in the FB search section, using a whole phrase Chern An wrote. I guess 19-15 words would suffice for the intersection of comments to narrow down to his comment. That sounds like a dream Jamey; a little mention can help so much to have a better start! Its great people are doing that! However, I’m finding that tough. I mean very very hard. Even when start knowing someone better, it is still a big thing that someone will mention you in their media! I am working very hard, and I feel like results aren’t that great. Maybe it is normal for new people in the industry! Your post as usually very good, an excellent refreshment for me! Cheers! I agree that spending too much time on it is pointless. To be honest, it’s slowly growing friendship between two people from the industry. When the bond between friends is strong enough, they start helping each other. I think it’s the matter of time and about giving (not only receiving), and you can’t quicken it. Like others are saying, this is no surprise in our market. When Tom Vasel says “You must have this game, go buy it.” about Cry Havoc, they run off and print 15k more copies. Our taste-makers are the reviewers. But for some they’re just getting a little dry sometimes and pump out too many too fast to enjoy what they do anymore. Thus leaving the taste for many games a little dry. A decent review from somebody in a bad mood that day, or in terrible lighting that doesn’t showcase the product well, could damage the image of an otherwise great product. I also agree with JohnWrot. The power of reviewers is strong and I too feel they sometimes forget how much influence they have on the success of game designers and small publishers. I wanted to mention an example of a tastemaker in the gaming industry. In Charlottesville (where I live) there is a board game called “Chickapig” that has received tons of local attention and had a really successful Kickstarter campaign last summer ($86,000). The designer of the game operates a small guitar company. One of his clients is Dave Matthews. The designer talks about on his Kickstarter page how Dave Matthews is a huge supporter and fan of “Chickapig”. I know Dave has even accompanied the designer to local bars, events, etc. to play the game. I certainly love giving credit where credit is due. When you ran the interview with Mike Strickland after his first Kickstarter failed to reach the funding goal, you definitely set him up for success as you provided him with an excellent platform from which he responded to the very inquiries potential Backers have when they hear of a potential relaunch. To that end, his relaunched Kickstarter project did exceptionally well, and I have no doubt a portion of it was due to your “tastemaker” role. Great post once again. I’ve started from the top of this KS list only a few days ago and can’t get enough of the compelling information you share. “But there’s a catch, particular before and after the Kickstarter campaign” should read “particularly before” or maybe “in particular”. Possible example of a good influencer… the success of Cytosis on Kickstarter. Some of that no doubt related to being able to brand itself as ‘Stonemaier Design Day highest rated game’? I’ve backed many of John’s games so I’d have backed even without that label, but the label did give me extra confidence to do so. I credit/blame Rahdo’s runthroughs with leading me towards backing games on Kickstarter! I didn’t even know about Kickstarter or that there were board game projects on there until I got watching his runthroughs and came across a game that was on Kickstarter at the time. (I don’t even remember which one it was now). But yeah for a few years I’d watch his videos and back a fair number of his recommendations. Mainly because me and my family seem to enjoy the same types of games that Richard and Jen do so it’s less of a gamble if you have someone who you know enjoys the same kinds of games as you do telling you that they loved xyz game. As usual Jamey, your informative posts are first class. Thank you!